Kings of Convenience are a music duo formed in Bergen, Norway, playing a style that features acoustic instrumental playing and their two voices. 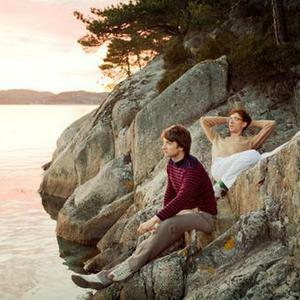 The band consists of Erlend &Oslash;ye and Eirik Glambek B&oslash;e. They met as children at a geography competition. They are known for their delicate tunes, calming voices, and intricately subtle guitar melodies. After first earning notice thanks to a series of acclaimed European festival appearances during the summer of 1999, the twosome signed to American label Kindercore to issue their lovely eponymous debut the following spring. After first earning notice thanks to a series of acclaimed European festival appearances during the summer of 1999, the twosome signed to American label Kindercore to issue their lovely eponymous debut the following spring. Quiet Is the New Loud was issued in early 2001 on Astralwerks. The album used many of the same tracks from the Kindercore release but re-ordered them and replaced a few with newer songs. The remix album Versus followed later in the year and featured remixes by artists as diverse as Ladytron, avid Whitaker and Four Tet. After a three year layoff during which ?ye recorded a solo album, 2003's Unrest, and gained some reknown as an electronica DJ while B?e worked on finishing up his psychology degree, the pair teamed up again for the recording and release of 2004's Riot on an Empty Street. After a 5 year layoff, the band released Declaration Of Dependence on October 20, 2009 on Astralwerks in the US and Virgin Records in the UK. Erlend &Oslash;ye has released some solo material and is also a member of The Whitest Boy Alive. Eirik Glambek B&oslash;e is also a member of a second band, Kommode. The Whitest Boy Alive and Kommode toured together this year for a short period.